I decided to make a new sign for my kitchen. It was originally going to go on the cabinets above the new range hood, but now I'm actually liking it on the counter instead. It was a very easy sign to make. I painted a blank white canvas tan, then brushed dark brown around the edge to give it a shabby effect. Then I simply printed off my wording and shaded the back with lead pencil. I taped it in place and traced over the wording which left a pencil impression on the canvass underneath, which I then coloured in. I love this! You make it sound so easy too! I want to try something like this. Thanks for sharing how you did it! I love your hand painted sign. I have recently painted a few and have really enjoyed it. 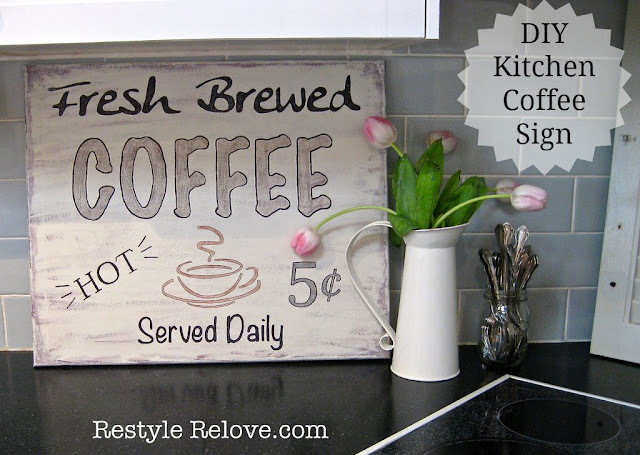 I am wanting to have a "coffee station" in our kitchen and I think your sign would be really cute. So great! It has caught my eye at different link parties.